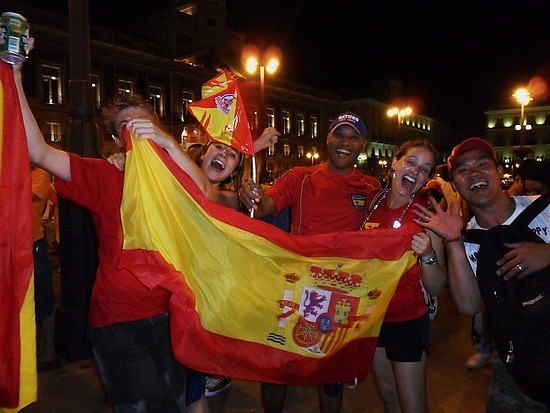 Just a few days after winning the most valuable soccer trophy—The World Cup—Spain is feeling the vibrations of excitement and positivism, as the streets are full of people celebrating and cheering their country’s first ever win. Economists predict that the euphoria generated by the win could lift Spain out of crisis and propel the country to an economic growth of 0,7% by the end of the year. The burst of excitement has temporarily overshadowed the gloomy economic reality that Spain is facing today. The economy shrank 3,6% in 2009 and is set to stabilize in 2010. The unemployment rate is as high as ever, stretching to 20%. Before the World Cup, many economists predicted Spain’s collapse to be similar to that of Greece, but with a lot more repercussions, since it is the European Union’s fifth largest economy. The good news is that all those woes may be healed by the magic wand of soccer. “It generates confidence in our country, here and abroad, and that will also be good for GDP,” Spain’s Finance and Economy Minister Elena Salgado told reporters this week, saying that the World Cup “is good” for the country. Miguel Angel Fraile, who is the head of the Spanish Commerce Confederation, representing around 450,000 retailers, said that “consumption will certainly rise, but we don’t know by how much,” according to an AFP interview. “When a society is happy, that always has repercussions on consumption,” he said. After the last World Cup 2006 in Germany, ABN Amro Bank did a study—called "Soccernomics"—on how the world’s biggest soccer competition affected the participants. “A World Cup winner enjoys an average economic bonus of 0.7 percent additional growth, while the losing finalist suffers an average loss of 0.3 percent compared to the previous year,” said the "Soccernomics" report.